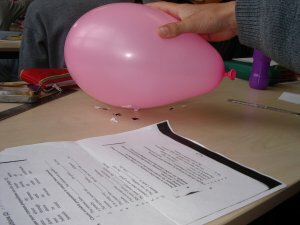 Experiment: To charge a balloon with static electricity, so that it attracts smaller particles and is itself attracted to a wall. 1) Rub an inflated balloon on your hair or jumper for about 30 seconds. 2) Put the balloon close to small pieces of torn paper or near to a wall. 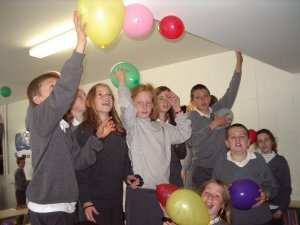 Result: The pieces of paper 'dance' or are attracted to the balloon. The ballon sticks to the wall for a short time. Conclusion: The balloon, when rubbed against your hair or jumper picks up negatively charged electrons. These electrons would normally be orbiting their atoms, but by rubbing against them, they are pulled away and on to your balloon. The balloon therefore becomes negatively charged. The pieces of paper and wall are more positively charged than the balloon - therefore they attract! Remember, opposites always attract!